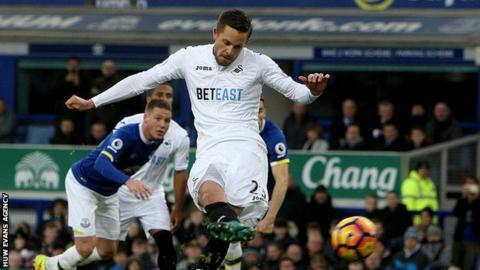 Gylfi Sigurdsson scored a penalty against Everton in last season's 1-1 draw at Goodison Park. Swansea centre-back Mike van der Hoorn believes the club have failed to replace Everton's Gylfi Sigurdsson. The Iceland midfielder left Swansea in the summer for £45m to join Swansea's next opponents Everton. "You see what he gives to Everton and that's what we are missing," said the Dutchman. "We have good players to do the same but he is a special player. "You can see why we stayed up last season and a big part of that was because of him." Sigurdsson, who failed to score or create a goal in his first 11 league appearances for the Toffees, has since found his feet under new manager Sam Allardyce. Despite the high price tag, Van der Hoorn said he was not surprised the midfielder made a slow start at Everton. "His [Sigurdsson] pre-season was not that good and I think that influenced how he played in his first few matches at Everton," said Van der Hoorn. "He wasn't playing games here, he was frustrated at training and we were frustrated." "I think that cost him, but now he is picking it up and he is a star player and we have to be careful of his free-kicks and his special quality." Manchester City have now won 15 Premier League games in a row - a new record. Following Swansea's 4-0 home defeat to league-leaders Manchester City, Van der Hoorn said Guardiola's side are "the best team" he had ever played. "I have played for Ajax against Barcelona and that was similar but they [Manchester City] are more complete, athletic and smart," he said. "They are the best and you know if you beat them it will be amazing, but they are the best team and you could see that today. "These are not the games to win but you always want to achieve something against the top team."